The November chill has hit us hard. And while no amount of prep can make us happy to face an ice-cold wind first thing in the morning, there are some things we can do to combat the cold. The most obvious solution is to throw on a few more layers. 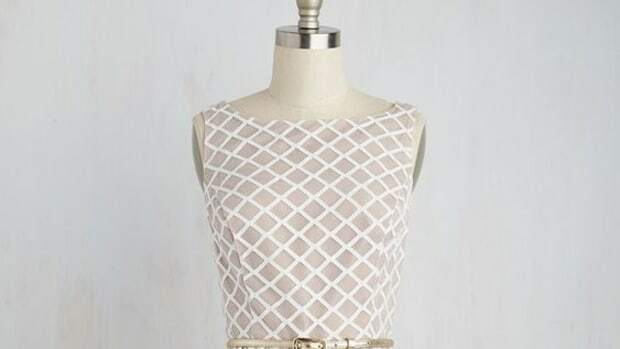 But more clothing becomes bulky—and sweaty when you venture indoors. 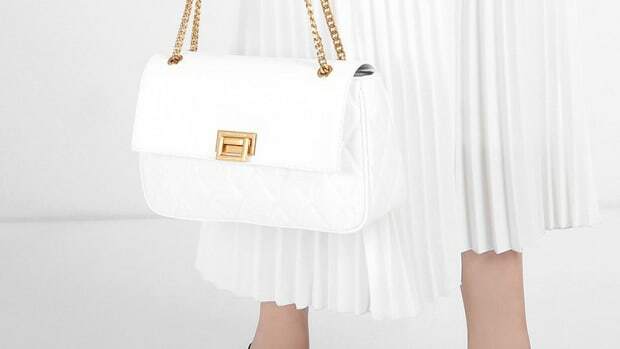 Luckily, it’s 2015, and some high-tech fashion is here to help. With some futuristic textiles, you might finally get a leg up on winter this year. Add a bit of moisture-wicking fabric here and some heat-retentive materials there, and you’ll be able to stay warm without the bulk. 01 & 02. 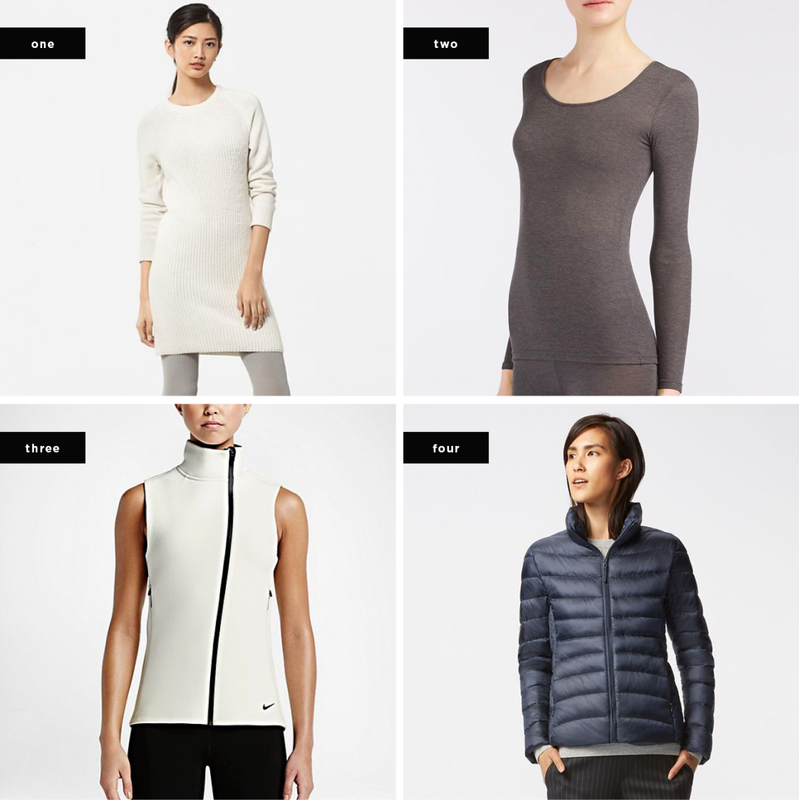 Uniqlo HEATTECH: Uniqlo’s futuristic HEATTECH clothing has moisture-wicking fabrics that also retain the body’s natural heat production. Their materials even have camellia oil to maintain skin’s moisture. If you’re especially cold come winter, consider the new Extra Warm line that boasts 1.5 times the heat retention over the original line. Slip on one of these long-sleeved shirts underneath your winter sweaters, or wear alone, and you’ll be toasty warm. Uniqlo also has HEATTECH knit sweaters. Bonus feature: Uniqlo is incredibly affordable. 03. Nike Therma-Sphere Max: An athletic legend, Nike has long been producing special materials to combat moisture and help athletes stay warm. One of its most recent innovations is the Therma-Sphere Max Training Vest. The layered interior fabric holds heat against your body while still allowing air to circulate. 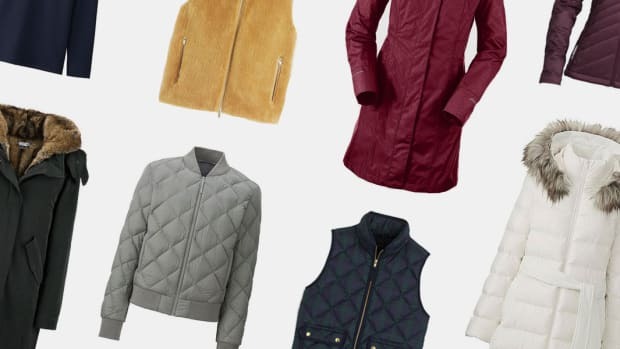 This slim-fitting vest would be perfect for wearing underneath your winter coat or over a turtleneck if you want to rock the sport–luxe trend. 04. Down Feather Jacket: Many manufacturers offer these ultra-thin plush jackets made from materials that move easily underneath your coat and won’t create a lot of bulkiness. They are great for transitioning—like if you’ll be gone all day and anticipate lower nighttime temps. The down can be compressed into a small size and is super-lightweight, making it ultra-portable. Throw it in your bag, and you’ll be prepared for any chill. 01. HEATTECH Pants: A great alternative to wearing tights or leggings to work, Uniqlo’s HEATTECH pants have the styling of more traditional trousers (that are also flattering) with all the heat technology of the other items. 02. Fleece-Lined Tights: Knit tights are perfect for layering underneath your pants—but fleece-lined tights take leg warmth to another level. 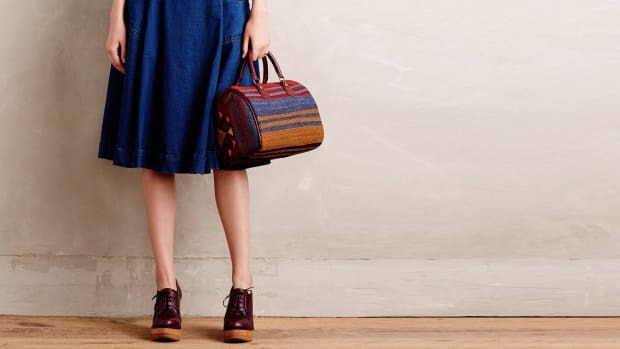 These are the obvious choice when you’re wearing a skirt, but the thinness of the fabric is great to prevent any bulkiness under your pants, too. 03. Merino Wool Leggings: Made from an ancient breed of alpine sheep, merino wool by Icebreaker is the top-of-the-line fleece fabric for beating the freeze. Fitted close to the body to regulate temperature, these leggings are made of lightweight 200gm pure merino rib fabric. 04. HEATTECH Leggings: Uniqlo’s Extra Warm HEATTECH leggings are perfect for layering underneath your pants and skirts. They also retain heat while wicking away any moisture. Their fabric is described as thick and sturdy—no cold breezes will get through these. 01. 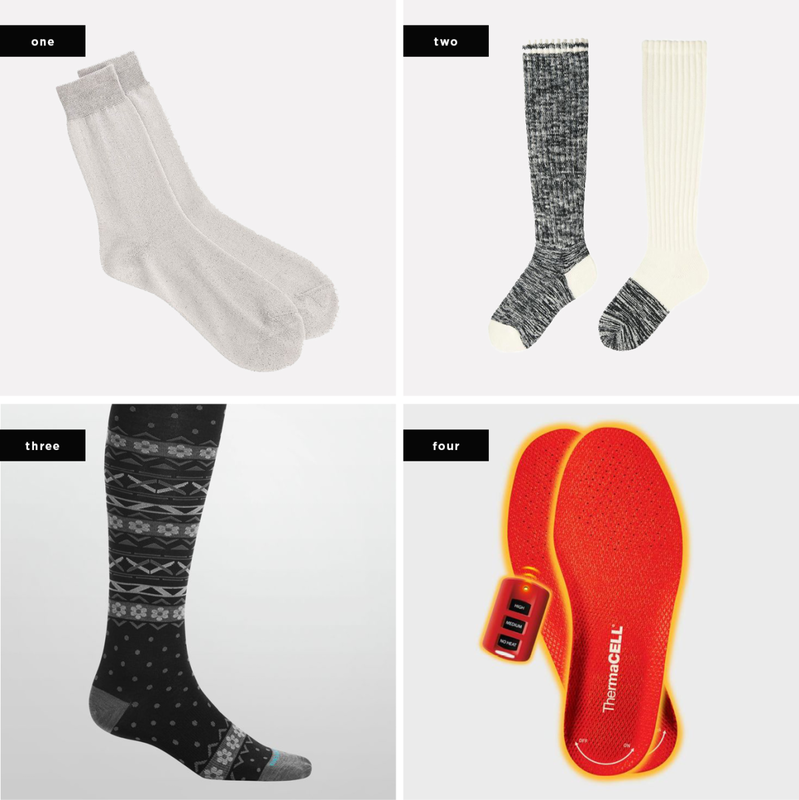 Thermal Socks: Originally created by NASA for keeping astronauts warm in outer space, these thermal socks were designed to reflect body heat with thousands of tiny heat-trapping pockets. The technology has been imitated for earthbound adventures and are perfect for layering underneath your knit socks or for wearing alone inside your boots. 02. HEATTECH Socks: Bio-warming, insulating, antimicrobial, anti-odor, and containing camellia oil moisturizer for keeping your feet soft—what more could you ask for in a pair of winter socks? Uniqlo wins again. 03. Merino Wool Knee-High Socks: If this wool can keep mountain sheep warm in subfreezing climates, it’ll definitely keep us warm this winter. Perfect for wearing underneath your pants or skirt or with your favorite boots, these merino socks are a worthy investment. 04. Therma Cell Soles: Ever heard of heated soles? Neither have we, but we’re definitely intrigued. ThermaCell heated insoles are controlled remotely and are chargeable for everyday use. 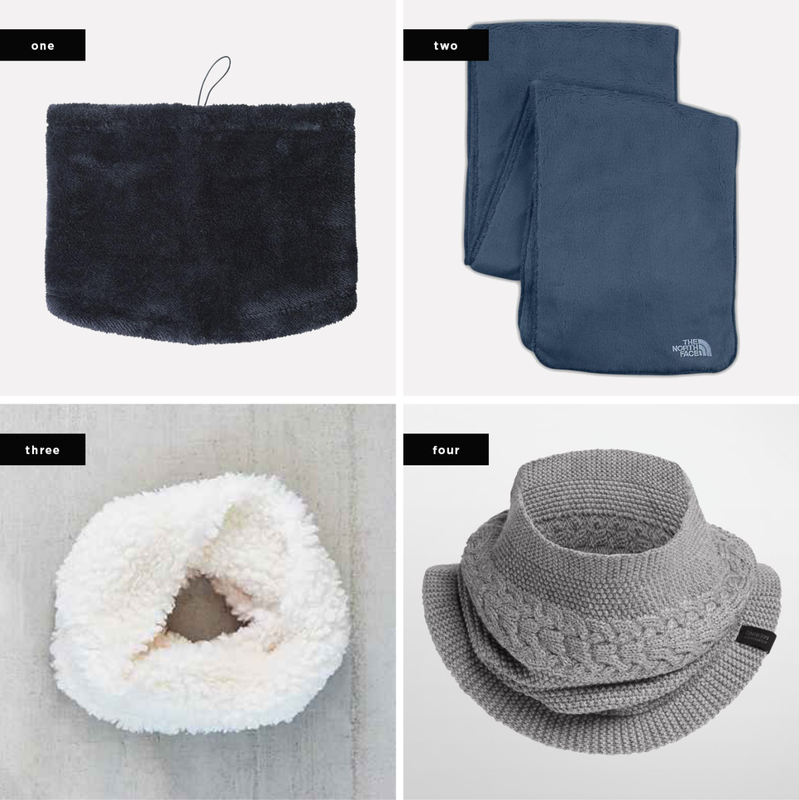 This might be a little extreme for the average gal just trying to stay warm, but if you’ll be outside for a long time or are really prone to the chills, you might want to check these out. Cozy toes all winter long? Don’t mind if we do. 01. UGG Shearling Headband: We all know just how incredibly warm and comfortable UGG boots can be—now imagine that comfort and warmth for your ears. The soft tan suede and fuzzy shearling lining make for a stylish headband, which is way better than the average beanie, no? 02. 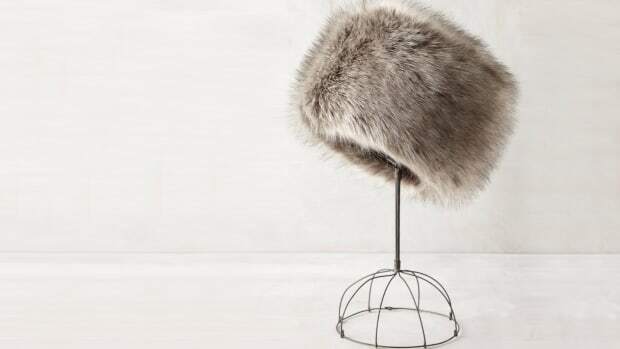 Faux-Fur-Lined Trapper Hat: Knit fabrics are great for staying warm—but nothing beats fur (even when it’s faux). Considering that 40 to 45 percent of body heat escapes from your head, it’s a no-brainer to make sure it’s covered. And not only are trapper hats optimal for keeping in body heat, but they also prevent the dreaded hat hair, as they don’t press your hair to your head as tightly as knit hats. 03. 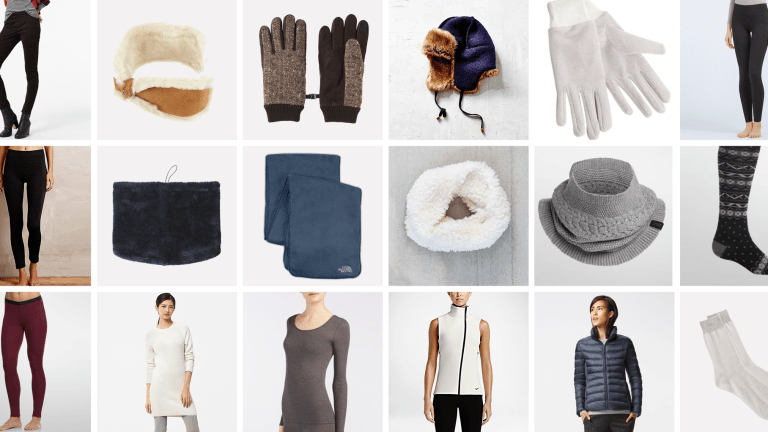 HEATTECH Gloves: Icicle fingers just won’t do. 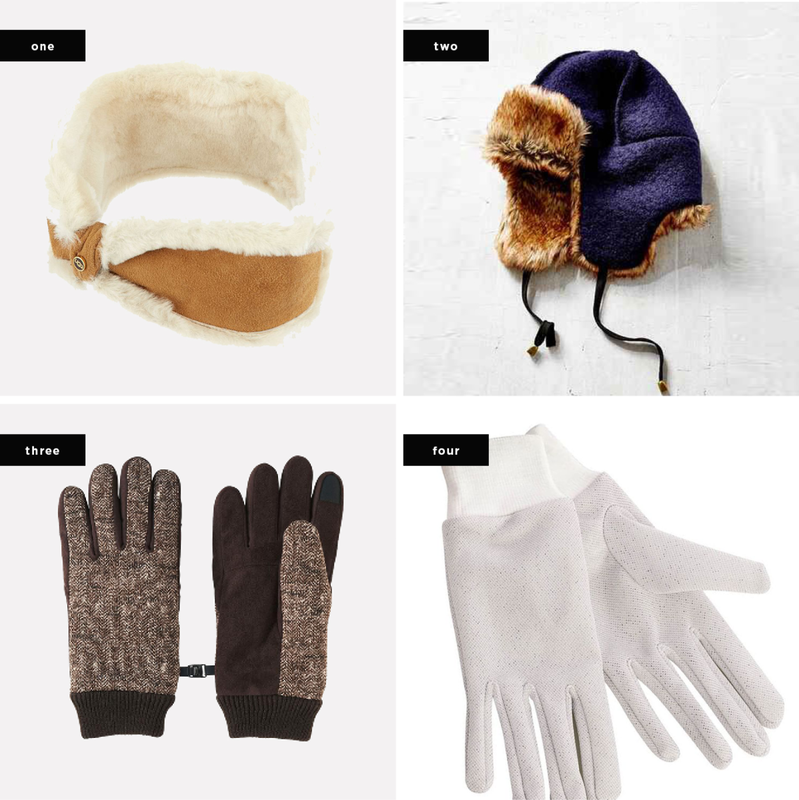 Instead of regular knit gloves and mittens, opt for heat technology gloves that go above and beyond the average hand jackets. 04. Thermal Glove Liners: They might not be the most stylish gloves you’ve ever seen, but their thermal heat-retaining design for keeping in body heat is enough to make us interested. Wear these simple thermal gloves alone or underneath your regular gloves for optimal heat retention. 01. HEATTECH Neck Warmer: Uniqlo’s soft microfleece neck warmer with absorbent and bio-warming material is a whole level above the average scarf. For even greater protection against the cold, this neck warmer has a layer of windproof film that prevents wind from blowing through. 02. North Face Fleece Scarf: The North Face never disappoints when it comes to winter accessories, and this scarf is no exception. This high-loft fleece scarf is as soft in person as it looks—and we are so ready to make it a winter staple. 03. Fuzzy Infinity Scarf: On those particularly blustery winter days, a thick infinity scarf is ideal for wrapping up to your nose as you push through the freezing gales. The soft fleece material is anti-itch and luxurious in texture. Can we wear this all day long? 04. Merino Wool Neck Warmer: The oversize chute-style design of Icebreaker’s unique scarf provides casual style that goes with any outfit. The super-soft knit features a combination of fine-gauge knit with a chunky cable detail and ribbed edges. No matter how cold it is, no one wants to look like a marshmallow.